I love trying all sorts of haircare-sprays but honestly many of them don´t do anything in terms of hydration or nourishment... The sprays with 2 phases (to be shaken before usage) usually work better as they have a bit oil/silicones and give smooth results however they can end up being too heavy. I actually purchased the Liese Smooth Hair Cocktail from eBay a while ago for my daughter as the spray is specifically targeted to smooth frizzy and tangled hair and her curly very heavy and thick hair really gets tangled so quickly so brushing is a pain for her when I don´t use something to smooth her hair. This spray is definitely a wonderful item for tangled hair and gives shiny smooth hair. It consists of 2 layers, one liquid one like a moisture milk so just shake and spray this onto towel-dry or dry hair (don´t overuse though as it migth make hair limp and a bit sticky). What I love about this fruit-scented spray is that even later on during the day hair stays detangled and smooth so it´s not just a temporary thing just for brushing. 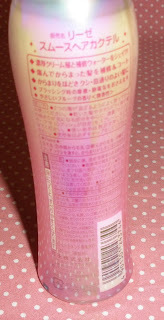 The cute pink iridescent bottle contains 140ml which lasts a while in my experience. 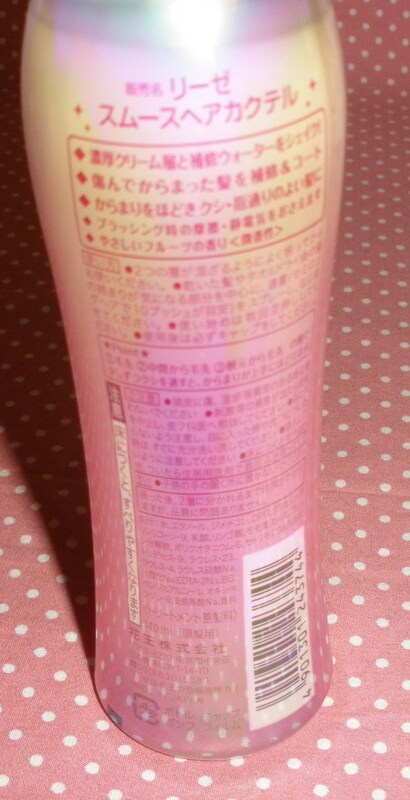 Sasa started to stock this for US$6.40 a while ago so I got a backup there since the first bottle is nearly empty. Also available on eBay if you do a search. OoO is this like the DHC hair lotion? ^^ Which one do you like better~? ooh I've been eying this product for the design and name. Haha. Thanks for the review! I'll have to purchase this the next time I see it. whoa, the packaging on this is sooo pretty!